Our elected officials make decisions every day that affect our lives and the lives of our patients. These decisions are often based on input they have received from advocates and lobbyists, constituents and fellow lawmakers. Regardless of our ideals, money plays a role in this decision making, because political contributions facilitate access to legislators and their staff. For better or worse, every member of Congress must raise an average of $18,000 a day to stay in office. That’s right—$18,000 a day! And those who contribute to this bottom line are able to have their voices heard more easily than those who don’t. This is why essentially every professional association has a political action committee (PAC). Without the ability to meet our lawmakers’ imperatives, it is more difficult, if not impossible, for us to educate our legislators on the issues that impact ACR/ARHP members and our patients. In 2007, the ACR established its political action committee, RheumPAC, and it remains the only political action committee dedicated to furthering the policy interests of rheumatology professionals. RheumPAC is focused on the action aspect represented by the name, political action committee, rather than the political aspect. Our contributions help open doors and create seats at the tables that allow the ACR and the ARHP to have an impact on rheumatology’s important policy issues. We do not support legislators or candidates on the basis of any single issue, philosophy or political party. Rather, we contribute to those candidates who support our issues and/or are in a position to further our priorities through their positions within Congress. Legislators who serve on committees with jurisdiction over healthcare policy or are House or Senate leaders, as well as those with a history of supporting healthcare legislation that aligns with the ACR’s positions, receive our support. As a result, our contributions are distributed in a bipartisan manner and are continually reviewed as positions or actions evolve. The focus is entirely on what is best for our membership and our patients. Investing in RheumPAC allows each of us to vote knowing our professional interests are being promoted and defended, regardless of our personal choices within the voting booth. Many of the constant healthcare policy changes are putting the current viability and future of our profession at risk. We must educate lawmakers on the potential consequences of MACRA, the CMS’s proposed drug payment proposal, as well as many other important issues. Campaign contributions and their related access have allowed the ACR/ARHP to influence these discussions and decisions on such matters as the NIH, CDC and other research budgets, Medicare reimbursement rates, access to therapies, and other regulations that affect all of us and our patients. Because of RheumPAC, the ACR Government Affairs Committee and our leadership have been better able to reach and educate our legislators and their staff about the impact of proposed policies, regulations, and budget items on our practices and the lives of our patients. 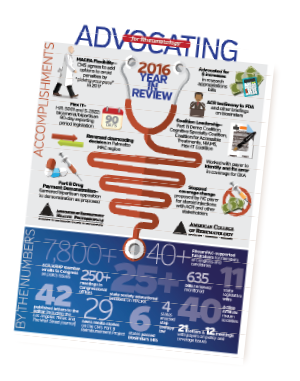 As you review our 2016 advocacy accomplishments, keep in mind that although 100% of our members are affected by these policies and benefit from these efforts, less than 5% of ACR/ARHP members invest in advocacy through RheumPAC. We are the only advocates for rheumatologists and rheumatology health professionals. If we do not have sufficient funds, we cannot accomplish our vital missions. If each of us is not willing to invest and participate in the policy process, who else will speak for us and our patients? We invest in RheumPAC because we consider it important to our future, our practices’ bottom line, our patients’ ability to access care and the viability of our profession. Are these not sufficient reasons for you to invest as well? If you are one of the almost 5% of the membership who has already invested in RheumPAC, thank you! If not, visit RheumPAC, and learn how you can support the College’s work on your behalf. If you have questions or concerns about investing in RheumPAC, please feel free to contact any members of the RheumPAC Committee or the ACR’s government affairs staff at rheumpac@rheumatology.org.